This is an image of the Zaamenkomst panel: one of the best remaining exemplars of rock art from the San people of Southern Africa. As soon as you see it, you are inevitably herded, like the eland in the scene, through a series of thoughts. Does it have a meaning? Why are the eland running? What do the white lines coming from the mouths of the humans and animals signify? What event is unfolding in this scene? These are questions of interpretation, and of explanation. Explanation is something people actively seek, and can almost effortlessly provide. Having lost their traditional knowledge, the descendants of the San are unable to explain what the scene in the Zaamenkomst panel means. In what ways can machine learning systems be saved from such a fate? For this, we turn to the psychology of explanation, the topic we explore in this post. Explanation is an omnipresent factor in our reasoning: it guides our actions, influences our interactions with others, and drives our efforts to expand scientific knowledge. 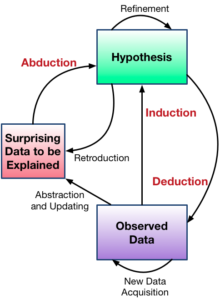 Reasoning can be split into its three constituents: deduction, reaching conclusions using consistent and logical premises; induction, the generalisation and prediction of events based on observed evidence and frequency of occurrence; and abduction, providing the simplest explanation of an event. We don't often use these words in machine learning, but these concepts are part of our widespread practice: deduction is implied when we use rule-learning, set construction and logic programming; inductive and transductive testing, i.e. making use of test data sets, is our standard protocol in assessing predictive algorithms; and abduction is implied when we discuss probabilistic inference and inverse problems. It is this third type of reasoning, abductive inference, that in both minds and machines gives us our ability to provide explanations, and to use explanations to learn and act in the future. There are different types of explanations. Keil (1992) explains that children use 'modes of construal' whereby they prefer different types of explanations in different situations. One taxonomy is of three types of explanation (Lombrozo, 2012): functional, based on goals, intentions or design; mechanistic, explanation using the mechanism and process by which an event arises; and formal, which explains by virtue of membership to a category. Mechanistic and formal explanations are also types of causal explanations. Functional explanations are default. Researchers from Piaget (1929) to Keleman (1999) show that functional explanations are the default, and used more naturally in children. Explanations are limited. We can struggle to detect circular explanations (Rips 2002) and we overestimate the accuracy and depth of our explanations (Rozenblit and Keil, 2002). Some machine learning methods related to abductive inference. It was recently suggested that forthcoming European regulations create a 'right to explanation' when machine learning systems are used in decision making. There are arguments both for and against this suggestion, but policy considerations aside, this emphasises further the importance of explanation and abductive inference in our current practice. The eland in the rock painting are running towards the elusive spirit world. By taking inspiration from cognitive science, and the many other computational sciences, and combining them into our machine learning efforts, we take the positive steps on our own path to the hopefully less elusive world of machine learning with explanations. Complement this essay with its prelude that contextualises the cognitive architectures that inform these essays, a short discussion on generative models and auto-encoders, and a neuroscience-inspired series of essays on learning in brains and machines.